Nota; FREE Wifi ad alta velocità, lavanderia GRATUITA e pulizia finale, skipass GRATUITI per le piste locali. Un bellissimo appartamento, con 3 ampie camere da letto, ampio soggiorno, cucina completa e 2 bagni. Mobili ed elettrodomestici sono tutti di elevati standard di lusso. L'appartamento ha una piscina coperta e sauna (situata nel seminterrato). Il bagno 1 si trova al primo piano dell'appartamento, accanto alla camera da letto 1 e 2. Il bagno 2 si trova al secondo piano dell'appartamento (attico) accanto alla camera da letto 3. Zeer compleet en goed verzorgd appartement in een mooie omgeving met alle voorzieningen op loopafstand. What a fantastic base to explore this beautiful area. Our week in the Black Forest has flown by and I'm sure we've only scratched the surface of things to do. We've been up some of the area highest mountains...Feldberg, Kandel and Schauinsland, sailed around Lake Titisee, tried out numerous cable cars and chair lifts, rode the Hasenhorn coaster and covered a lot of kilometres on foot. The cuisine has been great, we enjoyed your local pizzeria, found a lovely restaurant at Landwasser with fantastic views and have eaten plenty of Schwarzwälder Kirschtorte. The diet starts next week!! Thank you for allowing us to stay in your lovely apartment, You seem to have thought of everything to make your guests feel at home, including excellent wifi ( much appreciated by our teenage daughter! ).The apartment is spacious with fabulous views of the Schonwald Valley from the roof terrace and so well equipped. Thank you also to Heinz-Jurgen for his warm welcome. We look forward to returning to the Black Forest in the future and your apartment would be our first choice. 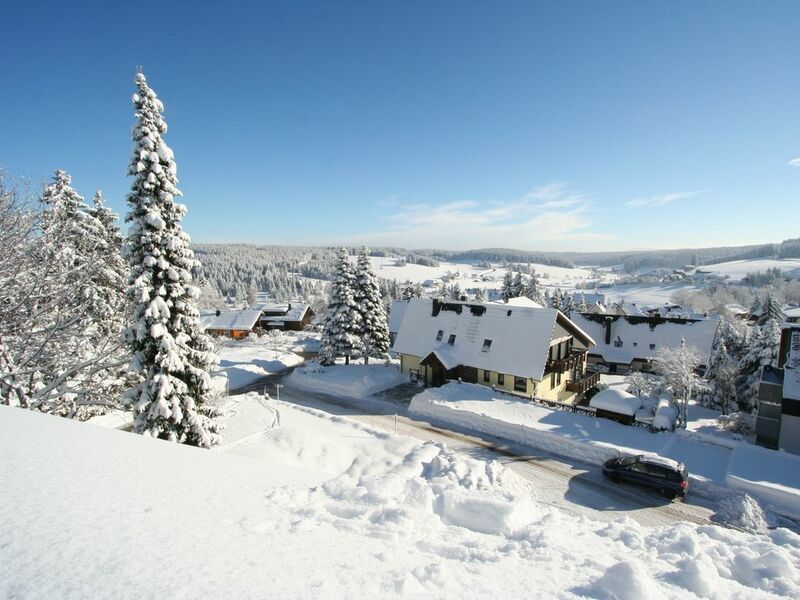 This was our second visit to the Black Forest region and we were certainly not disappointed. The apartment was spacious (plenty of room for a family of 5) spotlessly clean and very well equipped with amazing views. The balcony at the front of the apartment was sunny whichever time of day you chose to sit out there. The indoor pool was enjoyed particularly by our children too and apart from 1 occasion we had it completely to ourselves. We enjoyed Triberg outdoor pool and also visiting the waterfalls in the town. A trip to Gutach and the rodelbahn provided lots of fun. We would highly recommend a visit to Lake Konstanz and the spa pool there. The owners and caretakers were absolutely lovely and made communication and organising the holiday very easy. Thank you for a brilliant holiday. English translation; Perfect ! Just one word, PERFECT. No complaints. The house does not miss any detail and is neat and clean. The idyllic setting and the weather accompanied us. Great surroundings. The owners and Heinz super attentive. A 10 ! Topappartement! Mooi uitzicht, ruim, netjes, relaxte grote bedden en vriendelijke hosts. Aanrader! Ondanks een late boeking alles prima geregeld. Communicatie met Eddy en Hilde was top! Appartement is van alles voorzien en er is plek voor zes op de bank:) Ruime woonkamer, fijne slaapkamers met goede bedden en een garage voor onze racefietsen. Bedankt voor de complimenten. Leuk om jullie als gasten te hebben. Tot een volgende fiets vakantie in het mooie Zwarte Woud. Groetjes, Eddy en Hilde. Just back from another week here... nothing more to say really than fabulous apartment that is spotless. In a great location for lovely walks... only used the car once to drive to Europa Park. All arrangements and booking incredibly efficient. Can not recommend this apartment highly enough. Thanks again for another lovely week. The Robertson family. Un bel posto per rilassarsi per voi e la vostra famiglia. Lontano da tutto, ma ancora vicino all'azione. Godetevi la vita all'aria aperta in estate che in inverno, con le antiche città di Friburgo (Germania), Strasburgo (Francia) e Zurigo e Basilea (Svizzera), con storie che risale al 950 dC. opportunità per escursioni giornaliere includono; il villaggio di Triberg con la cascata più alta in Germania, Europapark di Rust (il più grande famiglia all'insegna del divertimento parco della Germania .. meglio di Disney di Parigi !! ), Negozi Cuculo-orologio, musei, la zona vinicola del Reno superiore Valley / Alsazia (e solo 2 ore da Monaco di Baviera Oktober Fest). Nelle vicinanze laghi cristallini; quali Titisee, Schlüchtsee e Bodensee, Flowerpark Mainau, La sorgente del fiume Donau (Danubio), Old viaggi in treno a vapore ... e molti altri. Una guida dettagliata informazione sarà inviata a voi e vi aspetta in appartamento. Questo è anche un posto per il buon cibo e bevande, tra cui il famoso 'Schwarzwalder Kirschtorte' (torta della Foresta Nera), e una vasta scelta di birre e vini locali; Godetevi la nostra preferita Gasthof Rossle nel (min 10) valle. Ski: 2 impianti di risalita nel villaggio, e molti di più nei villaggi circostanti. (Otterrete ski pass gratuiti con il Konus turistico pagamento delle imposte). Vi è anche la grande stazione sciistica 'Feldberg' a 45 min. unità, dove si può godere una vista sulle Alpi svizzere e 14 impianti di risalita e 16 piste per tutti i livelli di difficoltà. Da semplice famiglia gestisce un circuito FIS di Coppa del Mondo sofisticato.